A dmc reunion was held in Sunriver, Oregon. 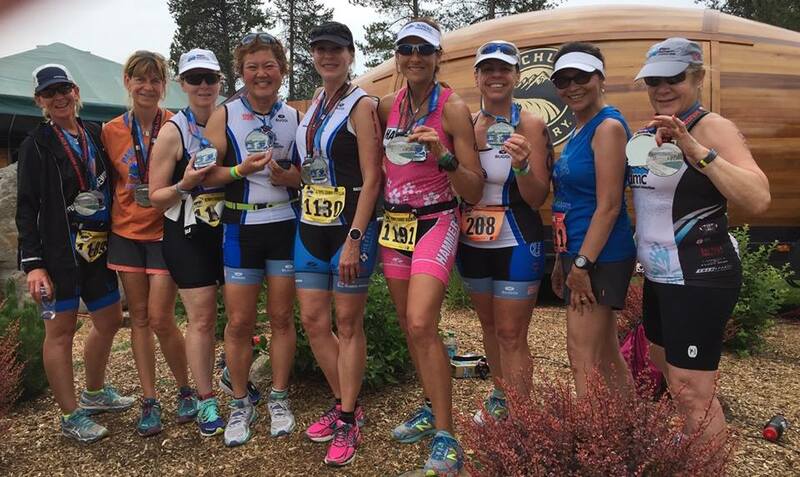 Alum Debby Ofstedahl and Wendy McCall, who recently moved to Bend, joined Sue Strause, Judi Warehouse, Kristin Chambers, Dianne Dunlap, Mia Okinaga, Kelli Rantz, and Maria Knutson for a weekend of riding, hiking, swimming, floating, stand up paddle boarding, shopping and RACING. The Pacific Crest Sports Festival takes place during the last weekend in June at the Sunriver Resort in central Oregon, about 30 minutes from Bend. 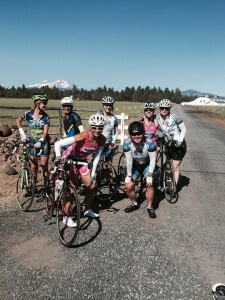 The events begin on Friday with Tour de Crest rides – 26 and 55 milers. 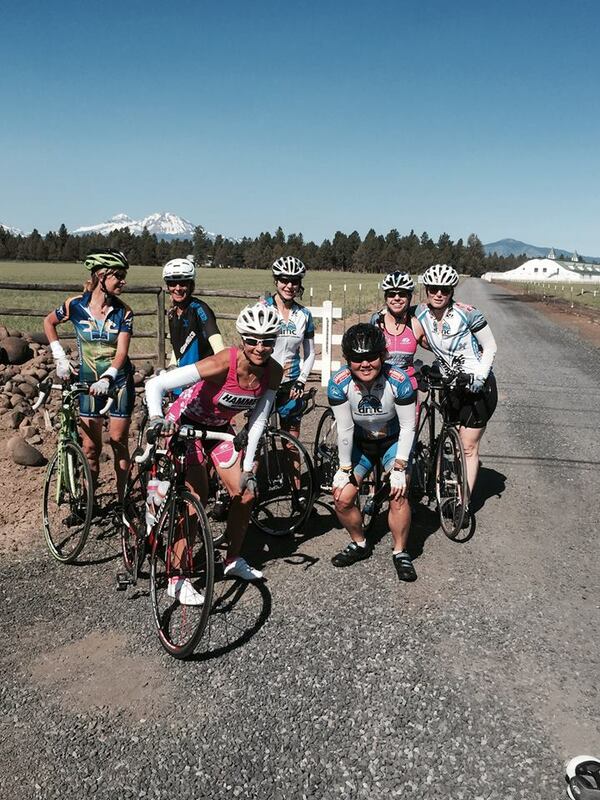 While the rides are short, Sunriver is at 4200 feet above sea level. You double centurions can easily add on beautiful scenic miles on buttery roads. There are views of Mt Hood, Three Sisters, Broken Top, Mt Bachelor, Adams, and Jefferson along with evergreens, lakes, and wild flowers. Mountain biking is huge and is Wendy’s passion. On Saturday, there is a marathon, half marathon, half Ironman distance triathlon and duathlon. There are kid races too. On Sunday there is a 10k, 5k, Olympic triathlon and duathlon. Finishers receive massive medals and if you do more than one event, you get a second “beast” medal that Debby got in addition to her age group finishes for both the half marathon and 10k. 7 of us started our trek on Thursday morning in three cars. It was a beautiful drive up and back. It took about 8.5 hours. Sue found/rented a house through Village Properties. It was $300 per person for 5 nights for a 3 bedroom, 3.5 bath 2-story house with all amenities (except air conditioning – it was a hot weekend). There were trails for walking and riding, paved and fire roads. There is a smooth paved trail to the lava lands too. There are two golf courses, two or three pools, horses, and tennis courts. The Deschutes River runs through the area. We had a light dinner at The Lodge which overlooks the golf course and open space. On Friday, Debby and Wendy took us on a 34 mile bike ride around Sisters, a cute town with a great coffee shop. We rode through flat and rolling country roads. After the somewhat leisurely ride though challenging because of the altitude, we had a great lunch including Deschutes Notty Blonde Ale. We went back to the Sunriver Athlete’s Village to pick up our packets and shop at the expo. Kristin was featured on one of the sponsor’s website because she looked beautiful in their cap. We had a fun dinner at Wendy and Debby’s and got to play with Cooper and Sammy, the luckiest dogs on earth. Cooper took a special liking to Dianne. On Saturday, we went for a short run on the trail near The Lodge. Kelli then led us through a short Pilate’s session. We went to the finish line to cheer on Debby. By then it was in the high 80’s. Regardless, Debby placed in her age group for the half marathon. Woot woot! Kelli and Mia rode their bikes to the Deschutes River so that Mia could practice swimming. It was beautiful and not so cold with a wetsuit but challenging to swim upstream. Felt a little like Huckleberry Finn with equipment. We saw some of the long course athletes running in the heat. We dropped off our bikes off at the Athlete’s Village so they could be transported to T1 (about 30 min. away). Only $10 per bike, well worth it. Had an early dinner and got ready for the race. 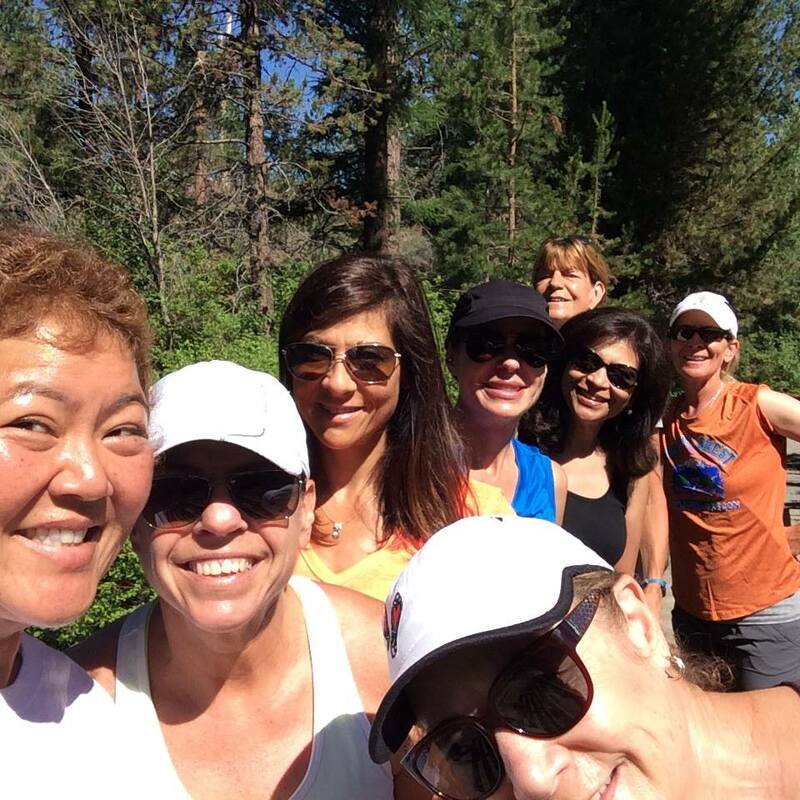 Race day Sunday: Debby and Maria did the 10k; the rest of us took a shuttle to the start at the Wickiup Reservoir. 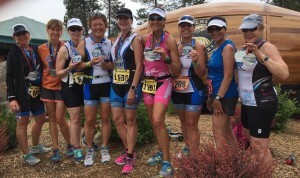 Wendy, Kelli, Kristin, Judi, and Dianne did the duathlon (29 mile bike and 10k run); Sue and Mia did the triathlon which included two swim loops. We all started around 9 am. The 10k is on rolling paved trails through the resort. There is some tree cover, water stops, sprinklers, and misters (along with a handful of aid stations). Kudos to Debby for winning her age group. She’s a beast!The duathlon is a timed start. Athletes line up two-by-two and are released every 15 seconds. Kelli and Wendy were a good match. Kelli killed the bike averaging 20 miles per hour with hills and altitude. Wendy caught up with her at T2 and ran the wrong way out of T2 as Kelli looked for her hat. It was neck and neck and in the end Kelli prevailed by 30 seconds. Kelli and Wendy placed 1st and 2nd, respectively in their age group. Judi rocked her AG by placing first. Dianne also placed 2nd in her AG. Special kudos to Kristin who had a fast bike split even though she is still recovering from ankle surgery. Woot woot woot woot woot woot!Sue, aka fish, swam the mile in a speedy 32 minutes, 2nd fastest in her AG. She was also 3rd fastest on the bike. Great job in placing 4th in her AG. Mia finished strong with a big smile on her face. We all celebrated by enjoying some post race food and beer at the Deschutes beer garden. During the awards ceremony, there was a lot of cheering coming from the “Lafayette” table. In addition to cheering for our team wins, we enjoyed trying to catch caps, visors, water bottles, race belts and other free stuff the staff were throwing out to the crowd. It felt great to finish, overcome the heat, and be cheered on by friends and teammates. It was fun to meet others like the elite athletes, SF Tri Club members and people from all over. There was a glow from all of us that shined through the evening. We celebrated at Wendy and Debby’s with barbecue, coleslaw and baked beans. We also celebrated Maria’s birthday with chocolate cake and vanilla ice cream, well deserved treat! Monday was our gift to ourselves. We went to Shevlin Park with Cooper and Sammy, walked along a river, saw pretty pink flowers and enjoyed each other’s company. We hydrated and ate delicious ocean rolls at a cutesy bakery in Bend. We then went downtown to shop – shoes, clothing, and jewelry. We had lunch at Barrio which had delicious tapas and draft beer. We topped the afternoon off at the Deschutes River – some did stand up paddle boarding, and others floated down the river in inner tubes, sipping beer. We are all grateful for the time together and our accomplishments, with the most major one being able to navigate to and from the house to the Village without taking wrong turns! Who’s in next year?